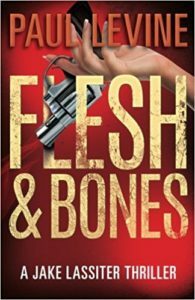 I very much enjoyed listening to Flesh & Bones by Paul Levine. It is a fun story about a lawyer, Jake, who takes a case defending a model, Chrissy. Jake is a former pro football player turned lawyer and Chrissy is an international fashion model. After too much booze and drugs as well as a series of bad choices in men Chrissy finds herself seeing a psychologist to put her life back together. Under hypnosis, she learns that her father abused her. The story opens with Chrissy shooting her father in a crowded bar — a bar where Jake was having a drink with a friend when it happened. Jake takes the case defending Chrissy. It is a tough defense because there were lots of witnesses and none of the facts are in question. The story was fast moving with humor, romance, and lots of plot twists. I listened to the audiobook and the reader, Luke Daniels, did an excellent job. The audio version came out a few years ago, but the book was originally published in 1997. I found myself occasionally cringing as attitudes about women were “old-fashioned”, but generally the characters were fun and fit the story. I think Flesh & Bones fits the classification of a good “beach book”, a fast fun story.